Location of the Father's House Discipleship school, held in-between Robertson and Worcester in the Western Cape Langeburg mountains. This school is held twice a year. During March 2014, Laurie-Ann had a spiritual retreat at Bethesda Renewal Centre, near Ottawa, Canada. She had been praying about where she and her husband Tony might minister long term or full-time in the next season of their lives. While she received a call into ministry in 1989, (which was further clarified through three short term missions in the 1990s, and six more in the 2000s), long-term missions was something that was put on hold until both Tony and Laurie-Ann could do this ministry together. After Laurie-Ann moved to Nelson, British Columbia for a brief career in radio broadcasting, she received a strong impression that she was to return to the idea and call of a long term/full time ministry. She returned to Ontario, and began a prayerful discernment process with her husband Tony. During her time of prayer and research, she came up with two ministries. One made sense with all of her "head:" which was a world-wide radio ministry. Since Laurie-Ann has a diploma in radio broadcasting, this one seemed to make sense. However, there was absolutely no pull on her heart. ​ The other ministry was Iris (Iris Global, or in Canada's case, Iris Ministries Canada). This ministry was one of radical love, not religiosity. Every time she saw or met Heidi Baker (and later her husband Rolland) they were truly refreshing and very real. She read Heidi's book, "There is Always Enough." By the end of the book she knew that she had definitely found the right ministry. Not only that, but she knew the practice of stopping for the one was right for her. In fact, Heidi Baker once 'stopped for the one' - Laurie-Ann - during a January 2010 Women on the Frontlines conference, held in Phoenix, Arizona. Laurie-Ann had joined a missions altar call the previous evening after Heidi spoke. The next morning, Laurie-Ann was worshipping at the back of the church and could sense a very strong sense of Jesus. It was like Jesus was standing right beside her. She opened her eyes and turned - and there was Heidi Baker, with a huge grin, and a bouquet of red roses. She gave Laurie-Ann a hug and a kiss on the cheek, handed her the roses, and continued down the aisle to the front. Laurie-Ann was in shock and wondered what had just happened. Her personal assistant said, "those were her roses, but she saw you worshipping and headed right for you." Laurie-Ann continued to wonder for years why Heidi had chosen to bless her this way. It wasn't until 2017 that she finally realized that she actually knew what it was like to be stopped for. At that moment, she was the one that Heidi Baker stopped for. It was like being directly loved by Jesus himself - because the presence of God was so strong in and around her. While Laurie-Ann had had divine appointments to bless others, it was then her turn to receive. Back up a few years back to 1995 at a Leanne Payne Pastoral Care Ministry School: Laurie-Ann received several prophetic words from a Vineyard pastor that she would have a ministry of evangelism and mercy. When she hesitated, she was told that she was not going to be like Billy Graham, but rather like Mother Theresa. Heidi Baker, and those involved with Iris have a similar call of a series of divine appointments. Sometimes it's as simple as that. ​ In July 2014, Laurie-Ann had a few months where she was discerning whether to attend a future Iris Harvest School (held in Pemba, Mozambique, the base from where Rolland and Heidi Baker live and minister). After each Harvest School, there are a variety of extended outreaches in which to minister and take part. Think of it as field work or internship after college training. At this time, Laurie-Ann was reading the required books for future Harvest School students, as preparation for when she would attend the school. She attended a retreat at an Eastern Ontario farmhouse, and met Darren Canning, a prophetic revivalist storyteller (who she would later work for as a social media assistant). When she shared with Darren about her dream to attend the Harvest School and that she was trying to decide whether to go on an extended outreach to either Israel, the middle east or South Africa, Darren told her, "I see South Africa all over you!" So that settled it, and she remembered that promise. Part of this hope was due to proximity to the school in Mozambique, but also due to fascination with leader Surprise Sithole, who is in White River, South Africa. (However, when it came time to choose an outreach in future, it was Cape Town and the Western Cape that tugged at both Tony's and Laurie-Ann's hearts). During 2014, Laurie-Ann discovered the Iris affiliate church that met in Williamsburg, Virginia (with a second campus in Richmond that still meets on Saturday nights). A couple of days before visiting the Williamsburg location, Tony and Laurie-Ann visited Norfolk, Virginia to take a boat tour of the nearby US navy ships. Tony used to be in the Royal Navy, so this was something he was excited about. Laurie-Ann stayed inside the boat, and during that time, the Holy Spirit whispered to her that they were about to meet a group of people who would bless her greatly spiritually. This was of course the Iris church called The Dwelling Place, led by pastor/revivalist Brian Britton. Laurie-Ann was deeply touched at this church on their first visit in June 2014, when they had two girls speak who had attended a Harvest School. She also met a dear friend Brenda Corey, with a deeply pastoral heart and apostolic ministry, and their friendship continues to bless Laurie-Ann to this day. Laurie-Ann returned to the Dwelling Place (Williamsburg & Richmond) in September 2014, by using a tax refund for expenses and airline points for hotels. She again listened to and was blessed by Heidi Baker, but it was Heidi's husband Rolland that would deeply minister to Laurie-Ann at this time. Laurie-Ann was still secretly grieving the loss of her radio career and was feeling stuck in life - not employed, yet not in missions yet either. Rolland seems to sense those who are joy-challenged and he does not let up in ministry to these people. After four services of Rolland following Laurie-Ann around, the deep grief was gone and was replaced with a deep trust. Trust is the foundation of contentment and joy. From then on, sadness has not been a major issue. So like Heidi ministered to Laurie-Ann as an apostle of love, Rolland ministered to her as an apostle of joy. She also had a deep connect with a local Williamsburg ministry to the poor called Loaves and Fishes, which was connected to the Dwelling Place. Laurie-Ann applied to Harvest School 22, on her own, but was advised that it would be best to wait for Tony to join her for a future school. Her hope was deferred, but there was wisdom in waiting, which included that couples who are meant to be in ministry together, need to learn together. So Laurie-Ann waited, but still connected with Iris Virginia for two visits - one week with Tony (at revival meetings and outreaches in April 2015), and one week with her mother as well to see missionary David Hogan speak. During those times, she continued to receive encouragement and love from her Iris "papa" and friends affiliated with that church. By January 2016, Laurie-Ann was excited to re-apply for Harvest School 24 with Tony (who was to retire from his full-time job within a month). Both were quickly accepted! At the same time, Tony and Laurie-Ann were offered an opportunity of buying a condo apartment in an area by the Ottawa river. Tony was excited by the possibility but Laurie-Ann wasn't so sure. She went to one of her pastors for advice, and strangely enough, Pastor Joe Mebrahtu said to her that he had a dream where Laurie-Ann had asked him to take care of a beautiful two bedroom condo while she and Tony were in Africa. When he shared this, both realized that this was confirmation that downsizing was the right direction. There were further confirmations, despite the apartment being just over half the size of their semi-detached home. So they prepared for three major things in their lives at the very same time - the downsize of items, sale of their house and preparation for the Harvest School and extended outreach. Tony and Laurie-Ann decided to take a week in Williamsburg, Virginia with the Iris church, but also to apply for their Mozambican visas for Harvest School. Brian Britton was away in Brazil, so the Copples bonded with Brian's wife/co-pastor Valerie, who has worked with orphans in Russia. Laurie-Ann still remembers Valerie's descriptions of orphan mentality and orphan spirit, which they later saw exhibited in Mozambique and in South Africa. Meanwhile, as they drove to the US, their real estate agent held an open house for potential buyers, While the Copples were arranging for visas in Washington DC, the house had multiple offers, and was settled and sold right after the visas were picked up! Two special gains at the same time! Then came the move into the condo in mid May, and the trek to Mozambique 10 days afterward. Both found the time intense, with a huge learning curve (particularly for Tony), but they were graced with what they needed. Laurie-Ann was warned by another of her pastors, Shawn Gabie, that the school would be an intense refiner's fire for her, but that this was a very good thing. It was a pruning time, and a time of dealing with frustrations (climate, schedules, spousal misunderstandings, minor illnesses and Laurie-Ann's arthritic knees). Shawn warned her to "keep her focus forward so she wouldn't forfeit what the Father had for her." This prophetic advice kept Laurie-Ann determined to not quit, especially when Heidi Baker shared many times that "If you don't quit, you win." And Laurie-Ann (and Tony) wanted to win. However, the teaching was excellent, the worship full of glory and love, the Mozambicans kind, and the outreach was amazing. This truly is a special place, and God was and is moving powerfully. By the end of the Harvest School, Tony felt a lot more confident in the ministry of stopping for the one as well as extended outreach. Laurie-Ann was overjoyed and could clearly see the amazing difference in Tony. She was also impacted in other ways, including an even deeper love for those she was to stop for, whether African, or foreigners. She became more patient, although still needed to see how the dream would materialize. By this time, Laurie-Ann and Tony began receiving a series of dreams, which began in Pemba, Mozambique, continued in South Africa and still continues in the US and Canada. Laurie-Ann received an impression that she would be teaching African children about art and radio. With this was a very clear picture of keen children who absolutely loved Laurie-Ann. Michelle was the first person to pray and see beyond Harvest School in what God may have prepared for Tony and Laurie-Ann. She shared her impressions with L-A by email, which are as follows:. (“Sing, O childless woman, you who have never given birth! Break into loud and joyful song, O Jerusalem, you who have never been in labour. For the desolate woman now has more children than the woman who lives with her husband,” says the Lord. "spread out and think big!" Psalm 27 Message version: He writes poems to Jesus? Small stories? You're a mother in the Spirit and your blessing in that is abundant. I see a hedge of protection around your household and those who are in it. It is far greater to be a spiritual mom that a natural one. You're an anchor, your're sold in Him as he shows you his pleasure and delight in you. He's saying, 'just be and the fruit will come.' He doesn't want you to be like the twelve tribes, because your desire is to hear Him. As you wait, vision comes, and you will walk into the land of milk and honey. You have a shepherd's heart. You will draw the water and not go thirsty. Just REST in Him, like Isaiah in the desert - he wants you to just rest. You are a waterer and a nurturer, helping to grow wild flowers in the desert. You are a history maker (read about Isaiah: streams in the desert and the highway to holiness). Terry Long (Vineyard Ottawa) had a word for Tony in March 2015 before he was to retire that this time in his life would not be an end, but rather a beginning. he would be launched into a new ministry. Danny Steyne (Mountain of Worship) had a word for many seniors in a Dwelling Place Richmond Virginia service in April 2015. He specifically went up to Tony and said, "You are not going to die, when you're retiring, God has a new ministry for you." Then he shared about opening up new types of reaching out as Tony would befriend the vulnerable, love on them and draw them into relationship. There was more, but it wasn't recorded. Jane Jones (Anglican Renewal Ministries of Canada / Redleaf Prayer / Cityscape Ministries) Jane had a word for L-A in May 2014 in Kanata, Ontario. The original audio is posted under Laurie-Ann's magazine article "Does God speak through Dreams?" Here's Jane's word: There's a new season coming in your life. I feel that God's going to give you the desires of your heart. There's something in your heart that you've longed for and desired. It's been so strong at times you almost find yourself walking in it. Sometimes we can get a vision and it becomes so real, and it's birthed in the spirit. But i feel the Lord is going to give you the desires of your heart, and He's going to make a way. He's going to make a way to do the things He's called you to do. He's going to open doors and make a way. It's like I see Jesus handing you a lottery ticket - I'm not saying you're going to gamble. Rather, He's going to give you something unexpected. Something unexpected is going to come into your path this hour. There's a place of provision that is coming. There's a door opening; there's a wind of the Spirit opening this door. With that open door is going to come the provision for what you need to do. There's people that will come alongside and you're going to see your dream fulfilled - I just really feel that. There's going to be no more hope deferred in your life, because a vision fulfilled is like a tree of life. You'll be able to see that vision fulfilled. You're going to find in this little while that this season will be like when winter turns to spring. This is the springtime, this is the springtime. You may see that it's coming about in the trees with the beautiful green that comes about in the spring. You're going to see a springtime in your life. There's something in the spirit that's breaking open. You had this cloud cover over you - I see that dissipating. The heavens are opening, the heavens are opening. You're going to walk in such revelation. You've had that before. You've longed to receive, and said, "God, they've seen this, and they've seen that." God is going to give YOU the visions. God is going to give you the visions. You're going to walk in a new level of revelatory revelations (Jane laughs as she's figuring out what that means). You know what I'm saying? You're going to walk in a new level of revelation and you're going to see things like Ezekiel did. You know what hen saw the wheels in the wheels, and the eyes. You're going to see extraordinary things. And you're going to say like Elisha did to his servant Gehazi, "Lord, open his eyes to see" (2 Kings 6:17). And you're going to open (his) eyes to the mysteries of the spirit. You're going to open peoples' eyes to see what is already happening in the spiritual (realm). This is a new season for you, babe. A new season, and it's a good, fruitful season. The seeds that you planted, the seeds that you planted years ago.... (are growing) the harvest is coming. They've (the seeds) have been buried by things, they've been buried by circumstances, buried by lack of finances, lack of support, but they're starting to sprout. The seeds that you saved from years ago are starting to sprout. There's a harvest coming in your life. Hallelujah, glory to God. Prophetic team ministry at Catch the Fire, Toronto Airport campus. January 2015 - More along the line of a harvest coming, with the admonition of gardening needing to be done in L-A's heart so that more of Jesus will show. Tony woke me up in the middle of the night while we were still in Pemba. He dreamed that I had a baby, but he didn't get to see the baby due to various distractions from family, work and his many ministry involvements in Ottawa. I knew from a Tyndale seminary course I had in dreams, as well as a course in Christian Spiritual Formations, that babies often symbolize something new - often a new ministry or idea that is to be cared for and launched. I remember asking him what colour the baby was, because since we were in Mozambique, the baby would likely be black. He didn't know the ethnicity of the baby, since he couldn't get to actually SEE the baby. So I prayed and asked the Lord if I would be given a 'download' of the baby - either by dream, vision or impression. It wasn't long before I was given a vision during worship in the Harvest School hut. I recognized that I was in a room where my 'baby' was. I then said, "Lord, please show me the baby up close." And the baby did appear to be black - at first. The baby became many different colours - black, brown, beige, pink, white, yellow, red etc. I wasn't sure whether that meant I was receiving a calling to different children around the world, so I thanked Jesus, and trusted that I would later understand what that meant. I shared this one with Johan and Marie Fourie, who understand dreams. Johan laughed at this dream. The baby was a rainbow baby. South Africa is often called the Rainbow Nation. Rainbow baby = Rainbow Nation. We found the place of a new ministry that we were being called towards. It was wonderful that Tony initially had this dream, since previous to this, most of the dreams and visions were received by me, Laurie-Ann. However, Tony recognizes that he receives inspiration and direction from God as well. Dreams: 2. The Stop Sign that would only say yes to South Africa: June 2016. L-A had a dream that we missed, and we've placed it after the dream about the rainbow baby. Tony and L-A were driving in South Africa, and we tried to drive down an unfinished entrance to a highway. The entrance was on a steep grade in tight circles like a switchback in a mountain pass. We stopped two thirds of the way down a cliff. At this stoppoint there was a lot of ice and snow covering the sides of the road. A big stop sign pops up. It has instructions to: 1. stop, 2. Ask God. 3. Press a button. There is a yes button and a no button. However the no button does not work. We find that when we're ready to press the yes button, the rest of the on-ramp unfolds out into the highway! So if we didn't say yes, we'd be 'stuck' on a mountain pass. Wow. This was 1 July 2016 (Canada Day). I was on a commuter train in England in the London suburbs. I was with several friendly passengers, including a man and a woman I particularly noticed. We arrived at a station called Agora, which was a stop before where I had intended to get off, but the passengers advised me that it was closer to my final destination. I had a suitcase and other items. I stuffed the suitcase as much as I could and placed it near the open door beside me. I then grabbed everything else of mine and stuffed my pockets. Everything was mixed up, but the train would start any moment. Finally I had everything just as the train started to move. By now several of my companions were already on the platform. I pushed the suitcase out to my friends and then jumped down. It took me quite a while to repack all the small items, which included opened boxes of buttons, pins and tacks. But at least I was off the train. I awoke. This dream was interpreted on 18 August in Robertson, Iris Western Cape, South Africa, in Marie Fourie's session on dream interpretations. The clue was the word agora, Latin for an open space, or field, I was to take one more major detour in my multi-career life (three so far) before the final destination, and go to the mission field for the fourth 'career.' What is also interesting is that agora also means NOW in Portuguese, and I had the dream in Mozambique, where they speak Portuguese. This was a short dream, where I was with my parents (who are both in their 80's and frail). In the dream I died, but after they buried me and grieved my passage, they actually flourished without my help or care. This one gave me insight that God would take care of them in my absence, since I had been concerned about them. They had a very bad season from September - December 2015. At the time I took time out of most of my ministries and involvements so I could help them. This meant I had to also take time away from Tony (although we constantly kept in touch). I have a blog post about that on my Ways to Grow in God devotional site. In November 2018, this promise was tested when my mother was taken by ambulance to a Mississauga hospital, and later had emergency bowel surgery. My sister was unable to help other than phone calls and advice, and ourr aunt and cousin stepped in to make sure my dad got home. Due to other family crises, my parents have had to find other help which wasn't reliable. I was nudged by Holy Spirit to text a PSW agency that helped my parents while I took care of them in 2015. It turns out that my dad also called them just days before, so there is help. In the meantime, I struggled on whether to return to Toronto from South Africa for a few weeks and help. I had no leading, and was advised by an intercessor in Ottawa Psalm 32:8 and Proverbs 3:5-6. I also remembered this dream as a promise. God is faithful, and will carry them, even when other family cannot. Tony believes that Mom will actually begin to flourish after she is healed from her surgery. I received this dream while I was enroute to see my Iris papa, Brian Britton in Williamsburg, Virginia. It was winter, so I decided to drive through the Pennsylvania mountains before a coming snowstorm. I stayed overnight in a hotel in Harrisburg. For those who know that area, Harrisburg isn't far from Hershey, where the original Hershey Chocolate company was founded. In this dream, Hershey's decided to sponsor me as the "Hershey kiss lady" to the latch-key orphans of South Africa. The sponsorship was $20,000 USD! I was shown a picture of me travelling in the townships (likely with Tony) and I had a backpack of small children's Bibles, and Hershey's kisses. I wasn't quite going door to door, but rather talking with families outside of their shacks and homes. What is also interesting is I did this when we were in the Robertson townships, neighbourhoods, children's centre and Kid's club. The candy I had with me wasn't Hershey's but rather Canadian maple syrup candies from Laura Secord. I wanted to share a taste of Canada, since we are Canadian. In the case of the dream I wondered whether I should contact Hershey's corporate about this dream. When you think of receiving Hershey's kisses (or hugs), you feel cared for - it feels like a sweet kiss. And wouldn't it be a lovely PR dream of Hershey's to do this. I wasn't sure, so I decided to check Hershey's corporate - it seems we won't qualify, since we're part of a "religious" organisation - and we're not in an area where Hershey works. I emailed Hershey's Canada and told them about the dream, as well as ask if Hershey's kisses are available in South Africa. ​ They are available in South Africa through their distributor, Patleys - who I plan to contact. Perhaps they can give us a volume discount. Here is what Timothy (a Hershey Canada rep) emailed me: "It's very nice to learn about what you and your husband are planning for South Africa." I have asked friends to pray for the dream's meaning. My employer, Darren Canning, sees it as a promise that Jesus will always provide (even through unusual ways) - which I gratefully receive. One of my Catch the Fire pastor friends believes that I should contact Hershey's. Another friend believes that the dream was all about the kiss - that God would use me in the townships, and that this was God's kiss to them. This view was further confirmed by a Kingdom Culture connect group leader that the kiss is from heaven, that when I would love, hug and kiss these children, like a parent/grandparent, they would be able to receive the love. Their capacity for receiving love would grow deeply so they would flourish in that sweetness. This is one of those dreams that can expand. I had a simple impression of a coming ministry, which made complete sense. Just as there is a Kid's Club near the Western Cape base for the local farm worker's children, so we could have another kids' club near where we are to live in Worcester. I distinctly saw a rainbow painted on the wall in the club house. 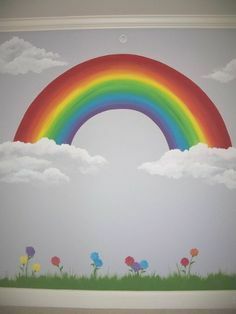 What's significant is the connection of the rainbow to Rainbow Nation (South Africa), the reference to different ethnic demographics, and also that there is a rainbow in the Iris logo! We also plan to live in Worcester. I trust we will have many more dreams to come! Dreams: 8. River that becomes a rainbow - Tony and Laurie-Ann were prayed over at Burning Hearts House of Prayer on August 24, 2017. There were several words about L-A handing out a cup of water. In one, the water was one huge drop, which was potent, but she felt it was small (but it wasn't). In another, the water streamed out of the cup and became a river that brought life and lightness to all the kids (and many others). Rocks that were previously a big burden turned into a beachball, suitable for play. Then Laurie-Ann was given an impression that the river turned into a rainbow (she attempted to capture some of the dream below). Laurie-Ann wrote an article about dreams for Fellowship Magazine, when she was still attending Tyndale Seminary. Tony posted a longer version of the article online. Note that Laurie-Ann does not specifically operate in the gift of dream interpretation. She does get words of knowledge - there is a difference. Article "Does God speak through Dreams?" Click on above audio to hear Jane Jones' word. Jane Jones (prayer coordinator for Anglican Renewal Ministries of Canada) had a word for Laurie-Ann in May 2014. Jane has known Laurie-Ann for years, from the time L-A worked as secretary bookkeeper of ARM Canada from 2000-2012.